With Tweet-Win Multiple Intelligence Promo Week 7, I learned that many moms support their child’s activity that shows multiple intelligence. I saw pictures of children enjoying swimming, playing piano, and dancing which shows body smart. Another child is a member of a star scout and a parent tweeted that her child is a member of a baton Club which shows people smart. As I run this tweet-win I choose multiple intelligence promo weekly, there are lots of good things I discovered from my readers of how they truly love their children by supporting their child’s activity. I really appreciate the entries of those who joined and shared. Be one of those who proudly shared in the Tweet-win I choose multiple intelligence promo. Join now! Join Multiple Intelligence Twitter Hashtag Promo? Like esupermommy fan page and follow @esupermommy in twitter. 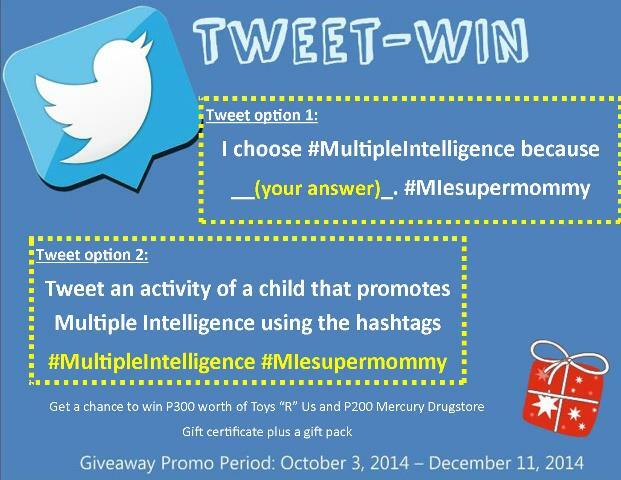 Participants need to use the hashtag #MultipleIntelligence #MIesupermommy in their tweets to qualify. Multiple tweets of one participant do not guarantee more chances of being chosen as one of the finalists but we can choose your best tweet. Participants may also post pictures showing how they develop their child’s Multiple Intelligence together with their tweets. If the picture shows a child/children in it, they must be at least 4 years old. Entries with photos of children below 4 years old will be disqualified. In addition, photos must not include pregnant women. Join Now! Enter the Tweet-Win Multiple Intelligence Promo Week 8 below. There will be one 1 winner for week 8. Claiming of prizes -Once winners received the tweet or email from me, they must reply to my message for confirmation. Toys R’ Us (worth P300) and Mercury Drug Gift Certificate (worth P200.00) plus a gift pack. Winners from Metro Manila may claim the prize at the Movent office in 11f Ecotower, 9th, corner 32ndAve., Bonifacio Global City, Taguig. Provincial winners will receive their prizes via courier. To learn more about multiple intelligence, please visit my post “Why Multiple Intelligence provides children with the real edge?. I’ve seen this contest on other mommy bloggers, I know I can’t join yours since I’ve already joined from another blog. I hope more will join! I hope you can join in my weeks 9 and 10. Thank you! Goodluck to all the winners. wow i love the prizes 😉 I will definitely join this contest. i hope to win! Perfect for the holidays! Thank you. I hope you can join. It’s alright! See you in my other giveaways.